Places like Cambodia’s Killing Fields, Auschwitz, New York’s Ground Zero, or the Wolf’s Lair where Hitler barely survived an assassination attempt in 1944, exert a powerful pull on travelers. The trend is so strong, The Atlantic Magazine just reported on what they call a “booming global industry in travel to macabre destinations,” which they dubbed “Thanatourism,” after Thanatos, the Greek personification of death. Cambodia, for example, is very dependent on travel and tourism as a source of revenue; tourism makes up about one-fifth of its GDP. The country’s main attraction is Angkor Wat, the stunning complex of Buddhist and Hindu shrines and temples built in the 12 century. The site alone attracts about 2 million tourists annually. But that’s not Cambodia’s only draw. Another major attraction is the dreaded S-21 or Tuol Sleng Genocide Museum in the capital, Phnom Penh. S-21 was the torture center of the brutal Khmer Rouge that executed about 20% of the country’s population during its horrific rule in the 70’s. Thousands of prisoners were killed at Tuol Sleng, but in spite of, or because of that, today it attracts thousands of fascinated travelers. 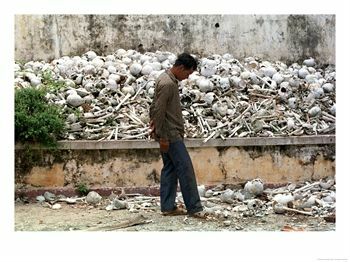 So do the infamous “Killing Fields at Choeung Ek, where 17,000 people were murdered, and human bones, shattered and smashed skulls still litter the site. Maybe. But the place is high on the Cambodian government’s list of places it encourages visitors to see… presumably as a lesson in history, and to raise badly needed revenue. Both The Atlantic and Professor Lennon see the demand for “authentic travel experiences” as a driving force behind the surge in Dark Tourism. The need to experience something “real”; memorable. Other theories suggest that increasingly, in an age of sterile technology, travelers want the shock of experiencing human tragedy. Or they want to show respect and be educated to a particular piece of tortured history and human suffering. Others argue that travelers to these places want to experience their own mortality or maybe derive some pleasure through the misfortune of others. Whatever the reason, Dark Tourism is increasingly big business.